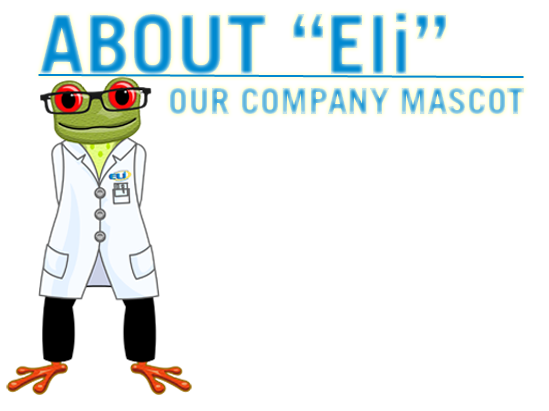 Hello, my name is Eli and I am so happy to be a part of the Environmental Laboratories, Inc-"ELI" family! Please allow me to tell you a little bit about myself! My home area, the rain forests of Central America are shrinking, so when the owner of ELI asked me to move to North America to become the Company Mascot, I was happy to say yes. I love new adventures and to be the spokesperson (actually spokesfrog) for ELI is such an honor. Spending time in the Midwest, also gives me a chance to visit many of my cousins and other distant relatives, since there are over 90-different types of frogs in the U.S. You will notice several of them helping us on this website. ELI and I agree on numerous aspects about the Environment, not the least of which is "Protecting Our Environment Today For Our Children's Tomorrow". I cannot say enough about how happy I am to be involved with the Team from ELI and we look forward to serving all of our clients across this fine Country. Many scientists believe the red-eyed tree frog developed its vivid scarlet peepers to shock predators into at least briefly questioning their meal choice. These iconic rain-forest amphibians sleep by day stuck to leaf-bottoms with their eyes closed and body markings covered. When disturbed, they flash their bulging red eyes and reveal their huge, webbed orange feet and bright blue-and-yellow flanks. This technique, called startle coloration, may give a bird or snake pause, offering a precious instant for the frog to spring to safety. Their neon-green bodies may play a similar role in thwarting possible predators. Red-eyed tree frogs, despite their conspicuous coloration, are not venomous. They are found in tropical lowlands from southern Mexico, throughout Central America, and in northern South America. Nocturnal carnivores, they hide in the rain forest canopy and ambush crickets, flies, and moths with their long, sticky tongues. Red-eyed tree frogs are not endangered. But their habitat is shrinking at an alarming rate, and their highly recognizable image is often used to promote the cause of saving the world's rain forests and in promoting environmental conservation in general as they are a vital part of our planet's eco-system.